SeaKing completed extensive upgrade work on three shortsea ferries operated by DFDS Seaways of Denmark. The four-week project took place at Damen Dunkerque Shipyard in France involving MS Dunkerque Seaways, MS Dover Seaways and MS Delft Seaways. 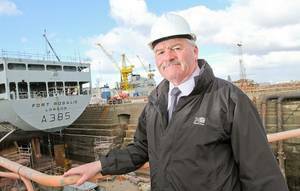 SeaKing Electrical managing director Dave Gillam said a 10-man team of engineering specialists were sent to complete the job. "Work consisted of electrical upgrades to improve entertainment reception to 80 cabins and fitting of VDSs (Variable Speed Drives) to car deck vent fans," he said. "A total of 16 VDSs were fitted on decks 3, 5 and 10 on each ship. The existing drives had degraded due to age and exposure to warm conditions. These drives play a vital role to help reduce fuel consumption, energy use and CO2 emissions. "The project was made more complex due to the time scales and working across multiple vessels requiring careful planning and project management. It demonstrates SeaKing's ability to provide a quick response project turnaround and flexibility to travel anywhere in the world whilst tackling an electrical engineering challenge. We take pride in delivering on time and on budget."